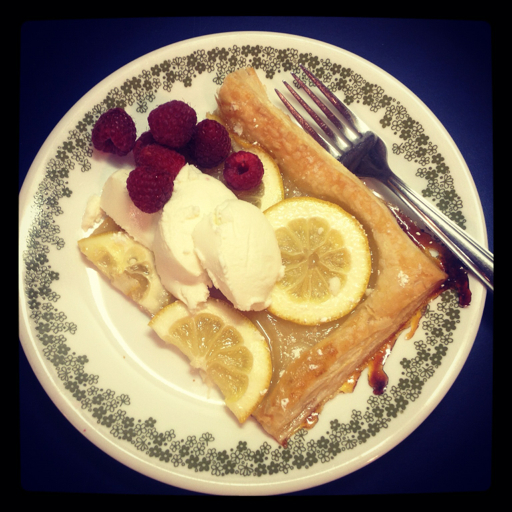 I recently became aware of an adorable online magazine called Sweet Paul, and was inspired to create this Lemon Tart. Now, in reality the recipe calls for Meyer lemons rather than regular ones, but I was put off at the grocery store by the fact that they were $4.99/lb! I figured a normal, $0.99/lb lemon would work fine. And you know, it sort of did, but the large proportion of pith of a regular lemon compared to a Meyer lemon did make it much more bitter than I presume one made according to the recipe would be. It doesn't taste horrible, but I love bitter foods, so maybe to others it would be inedible. Who knows! So I'm going to copy the recipe straight from the magazine here, and you can decide if you'd like to spring for the fancy lemons or not. I also didn't have vanilla ice cream to accompany the tart, so I topped it with some ricotta blobs and fresh raspberries, which was pretty delicious. Preheat oven to 390 degrees. Roll out the puff pastry to a little larger than its size, using a bit of flour to keep it from sticking to the work surface. Place pastry on a baking tray covered with parchment paper. Slice the lemons as thinly as possible and remove the seeds. 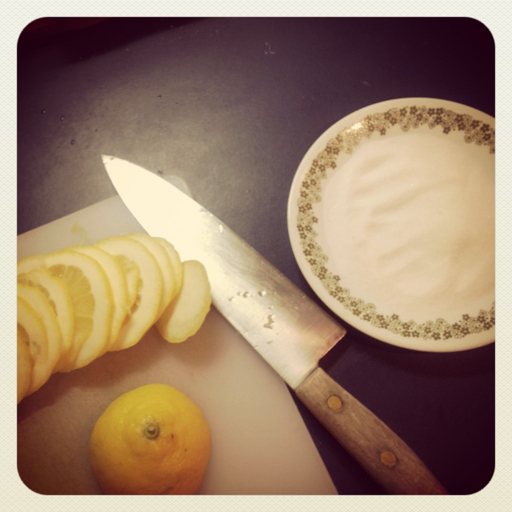 Dip the lemon slices in sugar and arrange on the pastry. Bake for 15 minutes or until golden brown. Remove from oven and sprinkle with confectioner's sugar. Let cool for a bit, then eat!